Are you heading to Chicago this summer on your J1 visa work and travel programme? 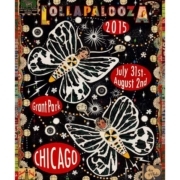 Lollapalooza 3 day music festival taking place in Grant Park from July 31 to August 2 is one of Chicago’s big summer attractions. Tickets go on sale tomorrow (Tuesday, March 24 2015). Line up is yet to be announced but check out some predictions of who will be playing from Chicago Magazine. J1 Ireland 777 South State accommodation overlooks Grant Park where the festival takes place: another great reason to book your J1 summer accommodation with us.